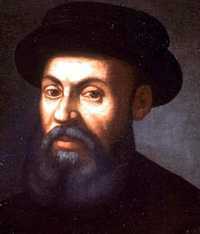 Ferdinand Magellan was a Portuguese explorer who sailed around the world between 1519–1522. His expedition became the first expedition to sail from the Atlantic Ocean into the Pacific Ocean. He started from Spain in 1519 with five ships and about 260 men. No body expect Magellan in that ship knows where they were going. His own king did not sponcered his travel. He got sponcership from spain only. He did not complete the entire voyage. He was killed in a fight with islanders in the Mactan Island, Philippines. Out of five ships only one returned to the harbor(spain) of departure after completing the first circumnavigation of the Earth, with only 18 men alive. The ship was called 'Victoria'.